Capstone Turbine Corporation, incorporated in 1988, is a California based gas turbine manufacturer that specializes in microturbine power along with heating and cooling cogeneration systems. Key to the Capstone design is its use of air bearings, which provides maintenance and fluid-free operation for the lifetime of the turbine and reduces the system to a single moving part. This also eliminates the need for any cooling or other secondary systems. The Capstone microturbine is a versatile and dispatchable technology that is fuel flexible and scalable enough to fit a variety of applications. The company sells microturbine generators for electrical power generation, cogeneration, biogas-fueled renewable energy, and hybrid vehicle power. Capstone has Microturbine offerings in the following sizes: 30 kW, 60 kW, 65 kW, 200 kW, 600 kW, 800 kW and 1 MW. Multiple turbines can be combined with Capstone’s APS or Advanced Power Server to create multiple megawatt installations. Capstone microturbines have generated some interest as a range extender for hybrid electric vehicles, in particular hybrid electric work trucks. Their light weight, small size and quick starting time make them ideal as “instant-on” backup power to recharge the main batteries. An example of a hybrid vehicle is the Capstone CMT-380, with a 30 kW gas turbine generator running on diesel, that recharges Li-Poly batteries when necessary. The CMT-380 has a proposed range of 80 miles on battery alone, but when combined with the microturbine that range is pushed to over 500+ miles. Capstone is a member of the U.S. Environmental Protection Agency’s Combined Heat and Power Partnership, which is committed to improving the efficiency of the nation’s energy infrastructure and reducing emissions of pollutants and greenhouse gases. 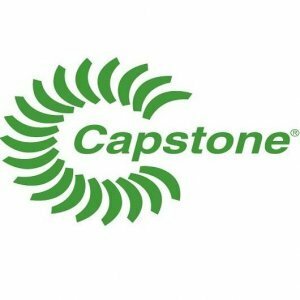 A DQS-Certified ISO 9001:2015 and ISO 14001:2015 certified company, Capstone is headquartered in the Los Angeles area with sales and/or service centers in the United States, Latin America, Europe, Middle East and Asia.